It’s the holidays and I come bearing gifts! And pretty awesome gifts they are, if I do say so myself. The first are my new favourite Christmas cookies. Yes, yes, I say this about all my cookies because I fall fast and hard for whatever new creation I’ve just made. But really, these are startlingly good. They look relatively plain and not all that fancy. They don’t have lashings of frosting and there isn’t a speck of chocolate to be seen. Or peanut butter either, for that matter. But they are tender and soft, almost melt in your mouth, with a lovely hint of anise. They are modelled after a classic Italian-style Christmas cookie. These would be the cookies I used to pass over on the holiday cookie plate in favour of the fancier, more gaudily festive ones. They simply looked too plain to me. But over the years, I’ve come to realize that there is so much to enjoy about the simpler things. This goes for life and for cookies. Simple, well-made cookies are such a pleasure. And let’s face it, the Italians do things right when it comes to the holidays. I created this cookie recipe for my friends at Swerve Sweetener, so the actual recipe lives over there. But it’s worth the click-through, believe me. And I am making a double batch very soon to giveaway to family and friends. **Please note that there is something wrong with Swerve’s nutritional analysis that we are trying to sort out. My software gives this information: Food energy: 164kcal; Total fat: 14.62g; Carbohydrate: 4.50g; Total dietary fiber: 2.33g; Protein: 3.73g; Erythritol: 15g. NET carbs = 2.17g per serving. Serving size is TWO cookies. Gingerbread is my favorite too! Followed closely by molasses. my favorite christmas cookie is maple meltaways but I love trying new recipes every year. I love, love, love spritz cookies! I think I also have found a compatible recipe. I will keep you posted as to how they turn out. Traditional chocolate chip cookies for me (now low carb, of course). I like gingerbread cookies and or sugar cookies! Same here! I love homemade chocolate chip cookies just a little crispy. For the Christmas Holidays I like Gingerbread! I love a variety of whoopee pies! Sugar cookies with every kind of decoration you can imagine. Kids love to help with these and making the cookie is easy but the fun and family togetherness never stops…. My favorite have always been Peanut Butter Blossoms and was thrilled to see your low carb version! I’ve made the full sugar ones for my family-they are packed away in the freezer-but now it’s time for me!!!! Can’t wait to try them, or these law carb Italian Cookies too. Thanks Carolyn. You’ve saved Christmas for me Lol ? I made the peanut butter blossoms yesterday! I ended up using real hershey kisses on top for some and still calculated net carbs at around 5 per cookie (My batch made 35 cookies). They are so delicious. Taste just like the higher carb ones. Any cookie works for me. I’m the original Cookie Monster!! Just yesterday the kids and I made the traditional roll-out/cut-out cookies with a buttercream icing, sprinkles, etc. I think they are my favorite. However, since I went sugar-free two years ago, I simply can’t eat a million of them like I want to, so I’m thrilled to try a simple low-carb cookie that looks as yummy as the pictures on this post! Ty for all your yummy recipes! 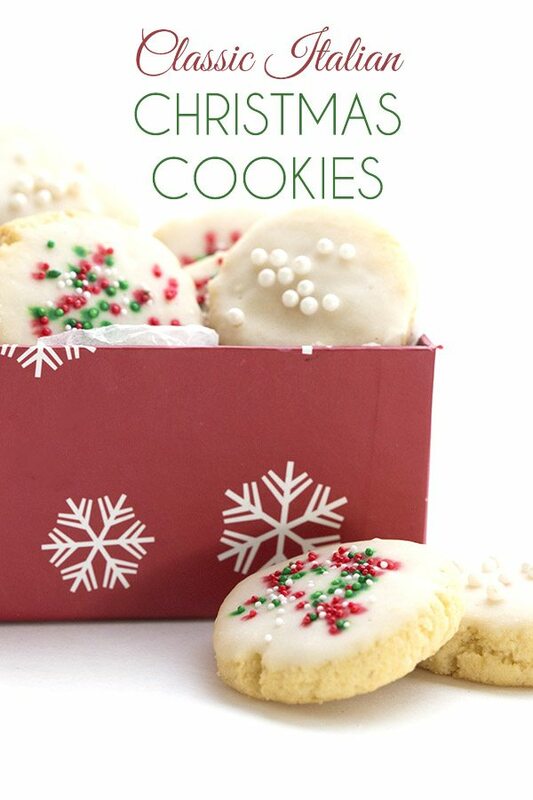 These look great – I’ll have to add them to my cookie list! Oh my gosh. I have wanted a kitchen aid mixer my whole life but could never afford it. Love your blog. Thank you for sharing such wonderful recipes. I love anything with chocolate in it, but I’m certainly going to try this recipe! Have you tried Chocolate Crinkles? They are my favorite! Will get to those someday! Anise cookies are my favorite, mostly since my mom always makes them. Well then you will love these! I love Swerve and am so glad that I can buy it at my local grocery store, rather than on-line now. My new favorite is your “Oatmeal” Chocolate Chip cookies! And they are my family’s favorite too! Nut rolls and cottage cheese rolls. Can’t have Christmas without those for this Hungarian girl:) in fact I will attempt to make more like a danish this year using a low carb Stromboli recipe. Do you calll it potica? Like Slovienans? I love ginger snaps but these look so yummy and pretty! I love ginger snaps and spritz. I live any cookie with chocolate and peanut butter! My favorite is the plain old sugar cookie. With frosting of course! I like the sugar cookies made them when kids we’re little they help to frost and put sparkles on going to make these today . ARE YOU KIDDING?? How can I just pick ONE favorite? I will say that yesterday I made two pans of Scandanavian Almond cookies for the first time – edges crunchy, inside soft and thoroughly delightful. First time I have made them and sure to be added to my ‘favorites’ list. WOW! I think these Italian cookies will be my New Favorite! Making them today! I have a 1992 copy of a Woman’s Day Holiday Baking magazine, and in it is a priceless treasure: Vermont Crackles Cookies. Easy and so, so delicious with good black hot coffee. Now that our household is gluten and (as much as possible) sugar free, Vermont Crackles are a fond memory. But a good one. Have a wonderful holiday, and bless you for your hard work, and remarkable recipe skills! I have to find a low carb recipe for these, but there are these ginger molasses cookies sold by a bakery nearby that are to die for. Otherwise, there is nothing like a great chocolate chip cookie! Being Italian, I grew up eating Italian cookies, so any Italian cookie I love. My favorite is krinkles – and now I have the low carb version thanks to you, Carolyn! Chocolate crinkles used to be my fave! Now I like your fudge bars, although like you, my favorite is whatevers in the kitchen! My favorite cookie is Molasses Lace, my aunt’s recipe. My mom always made Scandinavian almond cookies when i was growing up…I love them but haven’t had them in years! My favorite cookies were the ones you bought at the Italian bakery. My favorite holiday cookie is gingerbread men or soft molasses cookies. I love cookies, and I have learned to love simple buttery cookies the most (Shortbread, Russian Teacakes etc) I am looking forward to giving these a try. Cinnamon Stars-This is a meringue-based almond cookie I roworked using Swerve instead of sugar. I was surprised that the Swervo made the crunchy coating the same way the sugar does. My favorite has always been the Raspberry Almond Thumbprint. Peanut Blossom close second! Could you share this recipe? I have never heard of them! Sound amazing! My favorite cookie is the one that has frosting on it. Just like your recipe. thank! Love biscotti with almonds and cbocolate. Favorite cookies since beginning LCHF eating are any really rich buttery or almond butter cookies. Lots of dark chocolate never disappoints either. Thank you for all of your amazing recipes, so many to choose from this holiday, our cookie tray will be beautiful and so much healthier this year! I love anything not chocolate, and especially gingerbread!! My favorite holiday goodies are frosted cut out sugar cookies and anything chocolate/peanut butter! Thank you! This is my favorite Christmas cookie. Peanut butter and chocolate cookies or magic cookie bars. I always loved making decorated cutout spice cookies, it was a family traditional and my mother had a collection of more then 100 cookie cutters which she left to me and my sister. But I have to say I think I liked to EAT Mexican Wedding cookies the best! I’ve never heard of Swerve, but will look for it next time I’m in the store! My favorite Christmas cookie is a soft sugar cookie with cream cheese frosting. Your Italian Sugar Cookies sound wonderful! Custard creams – something my grandma and mom made. Basically shortbread cookies with jam in between and icing on top. And nanaimo bars – thanks for giving those back to me! My mom (who has know past) poinsettia sugar cookies. They were beautiful. My favorite is either my grandma’s date balls or double chocolate craisin cookies. Neither are low carb unfortunately. Frosted sugar cookies are my favorite. So making these with vanilla instead of anise flavoring will be perfect! Your pecan snowballs. I am making them again today. I’ll try shaping them into crescents. Still looking for my favorite low carb cookie. Sugar cookies are my favorite regular cookies. Hiring this new recipe is a winner! A mixer would be a lovely gift, I’ve never had one like this before. These cookies look so delicate and pretty, can’t wait to try them. But, I guess my favourite would have to be Browned Butter Snickerdoodles. My favorite is a chewy molasses cookie, but now that I’m Keto…. so far sugar cookies win. Love your recipes! Hmmm, favorite cookie. Decorated Christmas cookies are a childhood favorite. I love chocolate chip cookies. Also what can I sub out the almond flour with in this recipe? My favorite Christmas cookie is a Biscochito. Love this traditional New Mexican cookie which has anise and uses lard instead of shortening. These look amazing, can’t wait to try them. My favorite is Neapolitan cookies or Rainbows! Any chance you could do a recipe for them? I love the decorated Christmas cookies. To me there is nothing better than watching your baby girls make them and giggle – that is what Christmas is all about. 🙂 I think your beautiful Italian Cookies would be a fantastic treat to take to my daughter’s school Christmas party! I did cutouts and decorated cookies with the kids on our snow day this week! My favorite cookie is Starlight mint surprise. I have to make my own chocolate wafers as they don’t make Rockwell chocolate wafers anymore. I think pizzelles or mexican wedding or pfererneuse are all my favs…. My favorite is chocolate chip, and a close second is Italian ricotta. Thank you for this opportunity! My favorites are Italian Rainbow cookies. Haven’t engineered those to be low carb yet! Sugar cookies and gingerbread cookies! I love the traditional Tollhouse chocolate chip cookies! Chocolate chip is always a favorite but I really like most cookies whether it’s a holiday or not. Your brownie bark recipe has become a real favorite at my house. My favorite since I was a kid has been Sour Cream Christmas Cookies!! I love sour cream. What are those cookies, I’d love to try my hand at a low carb version! My favorite holiday cookie is the Chocolate Crinkle Cookie, like a brownie dipped in powdered sugar! Delicious! My favorite cookie is a Mexican Wedding cookir! Gingersnaps are my favorite for the holidays, but these look great! I’ll have to try them. I love soft sugar cookies! I definitely would not skip these cookies had they come by me! I might have to make my way to the kitchen today. Thank you, Carolyn! My favorite is Snickerdoodles! They are the best! My new favorite Christmas cookie, just discovered this November, is your Biscoff (Speculoos) Cookie recipe using Wilton’s Holiday Mini Cookie Cutters. Will be taking a batch to our family Christmas party. Laceys Milk Chocolate and Macademia, Danish Butter, Chocolate Chip… and many others. Anything with walnuts and/or pecans!! I love thumbprint or chocolate crinkle cookies! My favorite cookie is a soft dough cookie spiced with nutmeg and coriander. Sugar cookies and peanut butter! I would always make Italian cookie and I love them. I want to try these. I also make sugar cookies so my grandchildren can decorate them. I like buck eyes and well I guess I like them all. Yum! I love all cookies. I might try these with almond extract today. My favorite Christmas cookies are shortbread cookies! Swerve makes cooking easier! 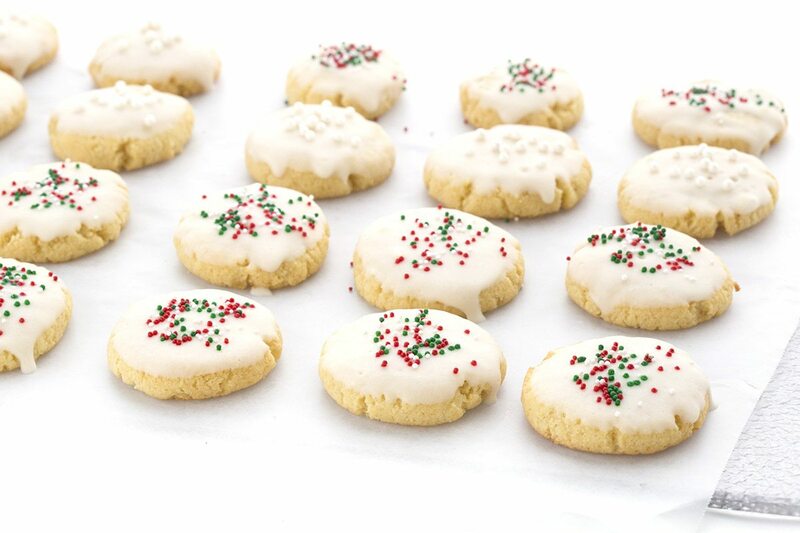 There isn’t a cookie i wouldn’t eat but I love classic sugar cookies and italian filled cookies…. of course now i look for low carb versions. I’m so looking forward to giving this a try! Yum another recipe I can’t wait to try!! Your recipes are always amazing. sugar cookies are my favorites! My favorite is making sugar cookie cutouts and decorating with family and friends. I don’t know what they are called they are lacy caramel on the top with a thin layer of dark chocolate on the bottom. I have tried finding low carb sugar free versions but have not yet found or figured out how to make them. I have so many, but I think I will choose Russian Teacakes – and I will be trying your Snowball version shortly! My fave holiday cookie is the biscochito. It’s a shortbread cookie flavored with anise, and it ain’t Christmas without it. I love, love, loe pecan snowballs! my favorite Christmas cookies are butter spritz! I have many favorites, Snicker Doodles, Choc-oat-chip and of course Short bread. My favorite holiday cookies are sugar cookies. The older and staler the better! My husband is always grossed out if I eat them after they are a few days old. Yay, Nanaimo Bars! you know I have a low carb version of those, right? My favorite holiday cookie is Norwegian Krumkake!!! I can’t choose just 1 favorite Christmas cookie but spritz or Russian tea cakes are up there. I have two favorites that I will try to make low carb. The first one is called mint tweeties, they have a brown sugar shortbread crust with a mint chocolate topping. They were my late sister in law’s favorite. I would make a batch just for her. The other is my friend’s ginger cookies. I make those for times when we have to take goodies to work, but I am going to try a makeover. Winning all of this Swerve would help with the projects of making these recipes into something low carb eaters could enjoy. The mixer would help too. Chocolate Chip and perhaps a few peanut butter with walnuts. Yum! I know exactly what type of cookie you’re going for here – both of my parents were born in Italy and my Nonna makes these at least 5 times a year. Very interested to see how the low carb version compares! I love peanut butter blossoms at Christmas! It’s not really a cookie, but Hardanger lefsa is my favorite Christmas treat. My favorite cookies are shortbread! I’ve never even heard of the originals! Excited to try these! Sugar cookies my kids decorate. My favorite cookie is an Austrian Jam Cookie! Seedless Black Raspberry Jam! I love one of my friend’s monster chocolate chip cookies recipe! It makes huge cookies and I think they could be adapted to use Swerve! So excited about this recipe, because this is my favorite! Thankfull for you recipes, love love love! I love Swerve and would love to win this package! I would love to see if Swerve works for Christmas “crack”. I know I would have to use molasses with the granulated Swerve. My favorite holiday cookies are ginger cookies. I’m excited to try this recipe! Yum, any cookie with chocolate or peanut butter! I love sugar cookies with homemade frosting! with you! You go Girl!! Ginger Crinkles! Thank you for offering the giveaway! I love shortbread around the holidays! My favorite Christmas cookie is chocolate chip, and frosted “sugar” cookies. Oh, childhood favotires, thumbprint cookies, Russian tea cakes, spritz cookies, shortbread, all now made new for me and mine through this wonderful low carb blog and others like it! Hot dang, Carolyn! You’re knocking these out of the park. I love speculaas, so many memories of my gram wrapped up in those cookies. My favorite Christmas cookies have always been the cut out sugar cookies I made with my mom and now I make with my grandchildren. The recipe is from a cookbook given to my mom by her grandmother when she got married. So I’m walking around Sam’s club looking for ingredients to some of your cookie recipes and I see this Swerve post….yeah, I’m parked on the side if an isle entering every which way I can!! One of my goals this morning was to find a place that sells Swerve in this town! So far, no luck. Ordering online is my only option. Grrrrr!! Maybe soon, though. Thanks for the chance and ALL of your fab recipes and low carb lifestyle advice! I couldnt do it without you!! I am 48 years old and STILL can’t pick one as a favorite! I love them all!! Love white chocolate chip cranberry! My favorite cookie is hard to pick. I love chocolate chip, snickerdoodles, sugar and dark chocolate cherry cookies. I have two favorites, pumpkin chocolate chip and sugar cookies with icing and sprinkles. I love the chocolate crackle cookies! My favorite Christmas cookies are snowball cookies. My favorite cookie is peanut butter blossom. Sugar cookies for decorating. Or Ginger bread. Too many decisions!! I have such a collection of your recipes, Carolyn. I made your dried cranberries yesterday. Thanks for all your efforts and your amazing creativity. My favorite Christmas cookie? It used to be thumbprint cookies made with oatmeal cookie batter and topped with a gumdrop. But not since going LC. I plan to try your oatmeal cookies if I can find my baking supplies and equipment. I was 85% packed to move when the contract fell through the end of last week. Life is always interesting. I love chocolate chip cookies. Now they are low carb and sugar free. I’ve also discovered coconut macaroons with sugar free chocolate chips. I love Serve and your recipes! Ooops. Swerve. Too early in the morning. My favorite is your gingerbread cheesecake bites. They just taste like Christmas! My favorite are gingerbread cookies. Molasses cookies partially dipped in white chocolate. My favorite Christmas cookies are thumbprint cookies. Cut sugar cookies were my favorite before I went low carb. I haven’t tried any low carb recipes for sugar cookies, but I will be! PB sandwich cookies are my favorite! Shortbread cookies. You know, the ones in the Christmas tins. Maybe only because they make me think of Christmas growing up. Definitely pre-keto! Thanks for the chance to win!!!! I absolutely LOVE cookies of all kinds and it’s so hard to pick just one, but if I had to it would be a soft sugar cookies. Yum! Thanks for this awesome giveaway! Good lord, I rarely meet a cookie I don’t like, but any molassesy or gingery cookie gets my top vote. Three are so many! I really like the tri color Italian cookies with the apricot jam in between the layers..yum! I don’t have a cookie baking at Christmas kind of family, but I used to enjoy eating store bought gingerbread men cookies and all kinds of Italian cookies. I am looking forward to trying these. Thanks for the giveaway, I’d love a mixer! My favorite cookies are Oreos. But they do not fit in my thm lifestyle now. I also love cheesecake cookies and chocolate chip and double chocolate. I have not had very much luck with low carb cookies but am excited to try these! I think they will. I haven’t tried it yet but I just made a double batch and I am going to freeze most of them. Sugar cookies with frosting decorated by the kids are my favorite! My all time favorite cookie is Choc. Chip, but since I have been on LCHF my FAVORITE is Snowball cookies. Looking for a new favorite since I can no longer eat my original favorite Almond Kiss cookies. I don’t think I have a favorite holiday cookie…I’ve seemed to historically like them all! Most don’t fit into my eating plan now though…so always on the lookout for ones made so that I can eat them! I have several favorites but I love my Mom’s sour cream twist cookies (a recipe I need to convert to gluten free one day) and her chocolate crinkle cookies. My favorite Christmas cookie is Buckeye balls. Haven’t found a low carb version that tastes like mine with graham cracker crumbs added. These look great. I think they’ll be a staple! My favorite holiday cookie is the traditional sugar cookie!! (: YUM! I’ve enjoyed all your cookie recipes so far. Keep ’em coming. My favorite are “forgotten cookies” minty chocolate chip meringue cookies. Made them last every year with my grandmother. Put them in the oven turn it off come back later and they were done. Light and minty after a heavy Christmas dinner. Soft sugar cookies with sprinkles. A soft cake like brown sugar cookie with a browned butter icing. My favorite is walnut roll cookies. Love a classic Nanaimo Bar. My favorite Christmas cookies are chocolate chip, gingerbread, and Russian tea cookies. I can’t pick just one! Spritz cookies are my favorite of all time. My favorite cookies are chocolate chip. Thank you for this amazing give away! Spritz are my all time favorite cookie. Ginger bread cookies and Spritz cookies are my favorites. I love raspberry thumbprints and russian teacakes. Try my cookies. Honestly, most people can’t tell they are low carb! I love spritz cookies and I cant wait to try this recipe! ?????????????????????? While I no longer eat the real thing, I lve a yummy sugar cookie! My favorite cookie is the old fashioned roll out sugar cookies. O love, love, love snickerdoodles! These are my very favorite! I am so excited to see a low carb version. I cannot wait to try them!! Seven layer cookies are my favorite. I love when my mom makes low carb gingerbread cookies with the sukrin brown sugar!! Love me some gingerbread! But sugar cookies are a close second!! My favorite holiday cookie is Magic Cookie Bars. My favorite holiday cookie, while not low carb because I have trouble finding a low carb cookie I love, are thumbprint cookies. So much butter! Have you seen my thumbprints? I have several different flavours. My favorite cookie is gingersnaps, followed by chocolate chip and butter cookies. Before low carb, it would have been Oatmeal Raisin. After low carbing for so long, I would prefer something simpler, like this beautiful Italian Christmas cookie. These are just beautiful! My favorite is Mexican wedding cakes. I would love to win this! I love your website and recipes! Thank you for this gorgeous creation! “…the Italians do things right when it comes to the holidays.” Best.Quote.Ever. Hahaha. (Not that me being Italian has anything to do with my bias!) LOVE Anise cookies. You are correct – they are a bit understated, simple and non-flashy, but they are So.Good. Especially dunked (yes – we’re great dunkers!!) into some hot espresso. Making today! I totally agree that the “sweet” cookies are nice but there’s something special about these! I grew up eating these so I’m very excited to try this recipe! Thank you!! My favorite are the Mexican Wedding Cookies! I use hazelnuts in them! Thanks for the change as the giveaway and Merry Christmas to you and your family!! I like different types of Christmas cookies, but tend to want sugar cookie cut-outs and gingerbread men. My favorite is whatever low carb one is in front of me at the moment. LOVE COOKIES!! I love anise pizelles. Nothing can beat the flavor and crispness of that cookie! If it says chocolate, I’m all over it!! Good old fashioned cut outs will always be at the top of my list!! I have a few I love, Santas whiskers, Mexican wedding cookies and Holiday biscotti with pistachios & cranberries. Favorite Chiristmas cookie is probably spelled wrong, Pfferneusse. Adore simple sugar cookies!! Thanks. Peanut butter thumb print cookies. Oh and the chocolate/oatmeal no bake cookies.? Ginger snaps. I’m looking forward to trying some of Carolyn’s recipes this year! I love almond sugar cookies. They keep me young at heart!!! My favorites are mexican wedding cookies. Thank you for the opportunity. So glad my cousin steered me to this site! My favorite cookie is a shortbread cookie followed closely by the biscoff cookie. I love soft gingerbread cookies !! Mm! “Sugar” cookies, made with Swerve, of course! My favorite cookies are called Snickers Surprise. I only make them for Christmas! Ginger snaps, any cookie really. My favourite holiday cookies are um………holiday cookies! I love ’em all! Printed off the recipe and heading to the kitchen to make them right this minute! I made them and I love them! Thank you for the recipe! I always like to try new low carb foods. These look really good. Sugar cookies, although I haven’t made them in a while, partly due to the sugar. I’d like to try this recipe to see if it’ll be a new favorite! Traditional chocolate chip and low carb Twix cookies are our new low carb fav. My favorite Christmas cookie is Homemade Sugar Cookies frosted with Vanilla Bean Frosting! Molasses cookies are my favorite. My favorite Christmas cookie has always been the cruncy butter cookies! I could eat a whole tin before going low carb! Now I make my own…..and I don’t eat the whole batch lol. My favorite holiday cookie is pecan crescents. Sugar cookies are the bomb!! My favorite Christmas cookie is peanut butter kisses/blossoms! Gingerbread boys with frosting on them! love following you on FB! Butter cookies. Haven’t had them in years. I don’t think I could pick a favorite. I love frosted sugar cookies but usually my favorite is the one I’m eating at the time! Chocolate chip! But these sound amazing! I like anything with chocolate, or a good sugar cookie! Sugar cookies. But homemade only. Not the store bought or tubed stuff. Buttery soft homemade sugar cookies. My favorite is red velvet chocolate chip cookies. I love sugar cookies with a fluffy icing. Yum. Never had a favorite. Never been fond of them. But I can see you starting one! Thanks for the giveaway!! Love the Chocolate Espresso Shortbread in your Low Carb Holiday Cookies! These sound delicious, and I’m sure they will be, just like your other recipes that I’ve made! Thank you for all you do! My favorite cookie is any cookie that I am eating. I love home made cookies, chocolate chip is the one I get request for. Thank you, again! My husband is Italian- I look forward to testing these cookies out on his tastebuds. Please let me know what he thinks! This was my take on the original but you know…it’s always different with low carb ingredients! I love lots of kinds of cookies,but one of my favorites is oatmeal cookies. My mom made Butter Cookies that will forever be “the” Christmas cookie. I made them with my kids and now my kids make them with my grandkids. I stick with the classic sugar cookie. These look delicious and perfect for a Christmas treat. I’ve never had Italian wedding cookies so I’ll have to give this a try. I don’t know for sure if they freeze well but I am banking on it because I just made a double batch for the freezer! Soft Sugar cookies with butter cream frosting. Sometimes I add crushed candy canes on top! after I try this recipe…. might be these. My favorite Christmas cookies are Russian Teacakes, aka Mexican Wedding Cookies. Yum! My favorite holiday cookies are ones that someone bakes for me (like my girlfriend Chris!!) since I don’t make good ones myself. I’ve tried tons of recipes and they never come out right. The only cookie I can bake are Chocolate Chip Banana Cookies and that’s because they are a cake style cookie. Sugar cookies in a shape turn out like hockey pucks. Not the perfect grandma cookies. Walnut Squares! Unfortunately, I have still not figured out a lo-carb version of these. The recipe has been a family fave for years. I really miss my great grandma’s impression cookies. I need to try to adapt some keto cookie dough to work with her recipe. These cookies look so festive! Thanks. These look yummy and sound very simple to make. Can’t wait to try this recipe! My favorite is Chocolate Orange Spritz! I love cranberry, pistachio cookies. My favorite is an almond bar cookie recipe I found years ago. My favorite cookies are Mexican Wedding cookies. Someday I’ll get brave enough to try a SF grain-free version…maybe if I win! Jingles! 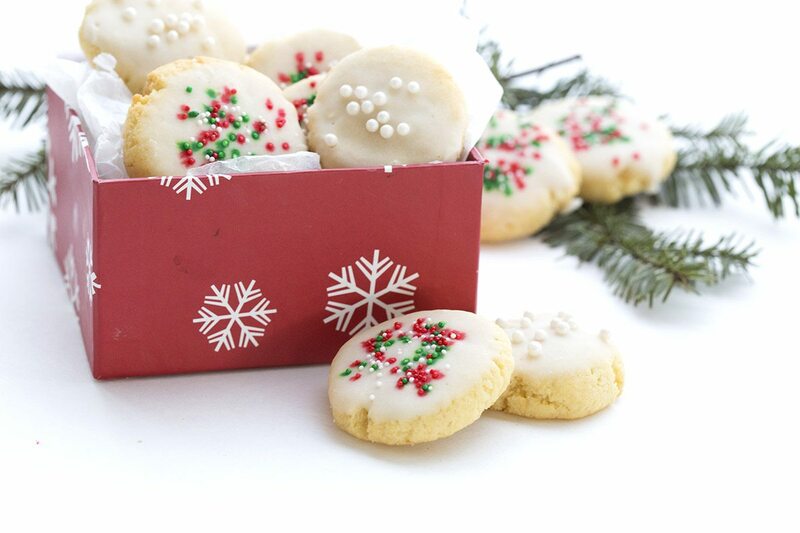 This recipe reminds me of the classic boxed holiday Jingle Cookies! Yum. My favorite cookie at anytime of the year is my sugar cookies. Chocolate Chip Cookies, all day everyday. On a side note, I just made these cookies. Nice flavor. Mine aren’t as pretty. A little brown on the bottom and edges. My oven could be too hot. Also, think I need more frosting, but these are a keeper. The husband loves them. p/s are they suppose to be on the softer side? Yes, they are supposed to be soft. As for the browning on the bottom, if you have a silicone baking mat, use that. It really helps protect the cookies. Thank you. I will try the mat next time. We really like them. Such an easy recipe. My favorite holiday cookie that my mom used to make is a no bake cookie made with peanut butter, butterscotch chips and corn flakes. But alas, I don’t have a low carb version of that. ☹️️ I sure miss those this time of year. Thanks for posting! I grew up with these, and have missed them for decades! It’s hard to choose between gingerbread cookies and snicker doodles. My grandmother made killer rum balls. Favorite cookies. Can’t have just one. Spritz, Snickerdoodles or Mexican Wedding cookies. I love Russian Tea Cookies, and Snickerdoodles, and fudge, and Cheesecake cookies, and Pecan cookies, and… etc, etc! You get the idea! Spritz are my favorite cookies! I really like nutballs, mine are like Mexican wedding cookies. Nut butter balls, aka snowball cookies! My favorite cookies are my great Aunts peanut butter cookies. Bring a smile to my face just thinking of them. I love all kinds of cookies!!! My favorite is cheese straws but I really like lady fingers, too! basically anything with chocolate is my favorite, but these Italian cookies look scrumptious too! Hot chocolate chip cookies are my favorite but also love watching my children make sugar cookies. Growing up my mom always made about 8 different types of cookies including Italian wedding cookies and Russian tea cakes. I have so many favorite Christmas cookies, would have to say Hungarian Christmas cookie, aka Kifli is number one! I love you website and all the eindferful revives you post. I’ve tried many. They are good! I love gingersnaps and peanut butter blossoms. I’m so glad to find your recipe. My son just became a firefighter and he is also a bodybuilder. His new co-workers told him how most folks drop off tons of sweets for Christmas at the firehouse and hardly ever bring anything low carb and/or without sugar. Several of them desperately want some “good” treats. So my friend and I are planning to make gift baskets for 3 firestations filled with low carb goodies. I’m sure these italian cookies will be a big hit. Thank you! Oh that’s a great idea. I hope they love them! I also have a recipe for low carb peanut blossoms. i am looking forward to baking with swerve this year. Pre- sugar free I loved those Mexican Wedding cookies and thumb print cookies… but these might just be my new fave! Thanks so much! English butter cookie cutouts then decorated. My favorite Christmas cookie is peanut butter with a chocolate kiss in the middle!!! I take that back!!! Mocha Chocolate chip is my favorite!!! My favorite cookies are Snowballs. I won’t turn down a pretty iced sugar cookie or a gingerbread cookie either. there is nothing better than a GOOD chocolate chip cookie (any tine of year)! Peanut butter Blossoms! My mom would make them every Christmas to share with friends and neighbors. I really love all kinds of cookies, but sugar, chocolate chip, and peanut butter are probably my favorite. My favorite holiday cookie has always been classic roll put/cut out cookies! I’m looking for a new favorite now that’s I’ve gone low carb! Im not sure of the name of my favorite but it contains chopped pecans and ae coated in powdered swerve! Snickerdoodles! Cinnamon + sweetener = yum! My favorite Christmas cookie is Snowballs. My favorite Christmas cookie are the snowballs; that’s what I call them, but I think they are also called wedding tea cakes. My favorite Christmas cookies are peanut blossums with a white chocolate/peppermint Hershey’s Kiss pushed into the center while the cookie is still warm. I’ve recently discovered spitzbuben, which are running a close second to the peanut blossum cookies! This time of year I love to bake (and eat!) Snickerdoodle Cookies. My favorite holiday cookie in my pre “healthy eating” days were the sugar cookie iced cutouts. Sadly, I haven’t really found one to replace them. I still make them sometimes, I just don’t eat them! My favorite holiday cookies are Sandtarts! I love chocolate chip cookies and they are my favorite,? Love your blog. Have tried lots of your recipes. they are great! I like any and all kinds of cookies! Just made these Italian cookies…to say they’re awesome would be an understatement! Thanks for yet another fantastic recipe! Low carb chocolate chip or a chocolate pecan cookie dusted with confectioners swerve would be my 2 favorite cookies. Ginger Snaps, Pecan Sandies, Pecan Pie Cookies, and Raspberry Rugelah are my favorites! Ginger bread all the way! These are going on my “to make for Christmas” cooking list! Good ol’ fashioned sugar cookies! These look great, but what I’d give for an oatmeal raisin cookie! I have always loved a good shortbread cookie. It would be a close tie between peanut butter blossoms and chocolate crinkles!! i love gingersnaps or just plain old sugar cookies. thanks for sharing the recipe! I love nuts, so I’ve always liked Mexican wedding cookies. Got to try them low carb. My favorite holiday cookies are Thumbprints! I just love the jelly center with the light butter cookie, yummy! I love a really good chocolate chip cookie! I use Swerve all the time, so I had to enter this contest! I love your browned butter blondies! I’m not a huge fan of cookies in general, but I’ve been looking for a softer and more simply-flavored cookie for the holiday season. Thanks for the recipe! I made your “oatmeal” chocolate chip cookies, with raisins and a couple of chopped dates in lieu of the chocolate, and my husband adores them. Thanks so much for your time and effort. Peanut butter!!! very nice giveaway! Pecan Sandies are my favorite Christmas cookie. My favorite holiday cookie is gingerbread. The aroma of baking gingerbread cookie takes me back to a table full of smiling flour painted children, all working together to decorate the family Christmas Gingerbread House. Now it’s but one grandchild, but one day she’ll smell gingerbread and remember a smiling flour painted grandma trying very very VERY hard not to lick the snow icing off her fingers. This might sound bad, but my favorite holiday cookie is the Danish butter cookies you get in the tins. If we’re talking homemade, though, it’s soft, ginger molasses cookies. Another great recipe! I love to read your blog and recipes and have always had good luck with them. Thanks! I love egg nog cookies. 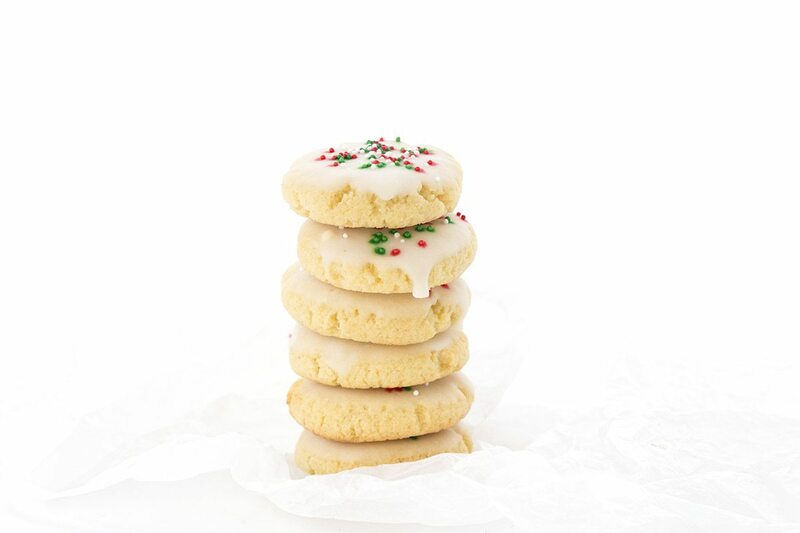 Definitely frosted sugar cookies during the holidays. Yum! This recipe may be my new fave! Wafer cookies with cream filling! I love sugar cookies, but I’d like to try this recipe. Those Italian cookies look amazing! Has to be Gingerbread Men cookies! I love cranberry pistachio cookies and lemon ricotta cookies! Sugar cookies…the ones we’ve made for generations we called Pillow cookies…I’m exited to make these Italian cookies..hoping they will be our new tradition. My Oma made these secret recipe oatmeal cookies…the best! My favorite holiday cookie is a seven layer bar… So good. So heavy. I’ve been working on KETO-ing it. Thinking about mixing coconut flour and a little pork rinds. Then some homemade low-carb sweetened condensed milk. Top with peanut butter chips, coconut, and macadamias! Chocolate chip with a cup of coffee. Thanks! Mine is flourless peanut butter! My favorite cookie is one passed down from my Mother In Law. It is an apricot thumbprint cookie. When we were first married, I didn’t really care for them. As I’ve gotten older, I find I prefer cookies that are less sweet. Now that my daughters are grown, they also make these cookies every year. We were in NM for Thanksgiving and had to go on the hunt for a box of some to bring home. This is my first sugar free Christmas, so I don’t know what my favorite cookie is yet! I used to love apricot thumbprint cookies. Haven’t tried making an lc version yet! Chocolate crinkle cookies for me! My favorite cookies are spritz cookies. I love buckeyes. I would like to try a low carb version. My family has a wonderful sugar cookie recipe that I just LOVE. Sadly I have not been able to eat it in years due to the gluten and sugar. I cannot wait to try this recipe and see if it can replace what I have been missing during the holidays. Thank you for all that you do! I love Russian Tea Caks. I have not found a low carb option yet but if I can I will make them this year. Search my blog for “snowballs”. They are the same kind of thing and I already have a low carb version! I did make your Italian Christmas cookies yesterday and they were super delicious and so easy. Thanks Carolyn. My favs are sugar cookies with a nice cup of coffee. YUM! Almond Cookies, Lemon Bars, Buckeyes! I don’t really have a favorite holiday cookie. Growing up I would say chocolate chip was my favorite, but they are not low carb. Thanks for the great giveaway. Chocolate chip are my every day favorite, even during the holidays. Thanks for the giveaway! Low carb peanut butter, my and my husband’s favorite. Even better now that your site introduced me to Swerve! my favorite Christmas cookie is a frosted sugar cookie! My favorite cookie is anything with chocolate!! I love a chewy ginger cookie or a nutty chocolate chip. Classic Sugar cookies are my favorite, and now ones without the high carbs! I love almond crescent cookies and chocolate crinkle cookies. Since moving to Denver, due to the altitude, we have not been successful making chocolate crinkles that do not fall unfortunately. Thanks for the recipe and the chance to win the giveaway. I love your blog! all of them!!! a spicy gingerbread or molasses for sure! I love sugar cookies and peppermint blossoms. My fave is your walnut cardamom snowballs! The Swerve site lists these at 16g carbs and 3 g fiber per serving of 1/12 of recipe (or 2 cookies, if making 24 cookies). That doesn’t sound right to me with just using almond and coconut flours. Did you notice that or is that correct? It’s actually correct but that’s because they are listing the Swerve “carbs” that don’t enter your bloodstream. Once you subtract erythritol, their Net Carb count is much closer to mine. I like almost any cookie except any with dried fruit. I especially like chocolate and peppermint! I love sugar cookies and pb/chocolate ones. And gingerbread. Oh I could go on and on! Gingerbread cookies are my fav! Anything Gingerbread are my favorite. My favourite cookie for the holidays are Chocolate Orange Blossom cookies!!! Imagine peanut butter blossom cookies but instead of a peanut butter cookie it’s a chocolate cookie with orange extract and orange peel! SO GOOD!!! It’s like a cookie version of a Terry’s Chocolate Orange! Arguably not a cookie, but I love magic cookie bars. Gingerbread cookies are a holiday favorite of mine, but I never met a cookie I didn’t like! Could one use anise seed or ground anise powder I have access to that if not that is ok. theses sound yummy. Sure, I think those would be fine. Shortbread cookies and frosted sugar cookies are my favorite anytime of year. Not quite the same with low-carb versions, but I am learning to like them. My Aunt’s sugar cookies and oatmeal raisin. I love making cookies and decorating them more than eating them! Pecan shortbread and peanut butter! Sugar cookies! I love your blog and recipes! Any type of cookie is great! Favorite cookie is soft chocolate chip. Love molasses cookies…my grandmother’s recipe! My neighbor always makes the traditional Italian cookies like these and I LOVE them! I’m excited to try these myself this year. These look beautiful! I love your website and have enjoyed all the recipes I’ve tried so far. My Mom’s recipe for rolled (lemon flavored, frosted) sugar cookies! Gotta figure out how to THM them! Okay, cheating. Not really a cookie, but Martha Washingtons (candy). Those are my Christmas favorite! Sugar cookies are my favorite. I haven’t tasted one in about 25 years though. I should find out if there’s a sugar free version. I really like soft gingrr cookies and shortbread cookies. Shortbread cookies are my favorite. But, really, all cookies are my favorite. These are my favorite Christmas cookie! Thank you Santa!? How to pick?!?! I love an old fashioned sugar cookie with a cup of hot coffee. Can’t wait to try these. Thank you! Hands down, gingersnap cookies are my favorite. Would love to win the giveaway! Any cookie is a favorite with me . . . I love cookies!! My favorite holiday cookie is definitely shortbread. My favorite is sugar cookie. I absolutely love the peanut butter blossoms at Christmas! Can’t wait to try your recipe! Another fave is Mexican wedding cookies-so delish! Chocolate chip are my favorite any time of the year! Love, love, love decorated sugar cookies at christmas time. Christmas isn’t Christmas without a skillet cookie! I love to make cut out cookies with the kids. Hopefully we’ll make those next week! My fav is Russian tea cake/Mexican wedding cake with pecans! These look amazing! One of my favorites is the Russian tea cake cookie. Can’t wait to try these!!! My favourite cookies are shortbread… mmmm.. just can’t get enough! Does anyone have a good low carb version for this Christmas? Thanks for this recipe. I love these cookies and the Italian Pizelles that many of my South Jersey neighbors used to make and gift us every year! Classic Sugar cookies are my favorite! I just bought a bag of Swerve. Now I know what I’m going to make first! These cookies sound amazing! Since I’m Italian, and love all things Italian I will try these out. Italian cookies are my fav. And was actually just thinking about Italian cookies the other day. Thank you for designing this cookie recipe. My favorite Christmas cookies are my parents old fashioned sugar cookies! I need to try to adapt them to low carb! I love my Mom’s sugar cookies! They’re my all-time favorite! I have always loved decorated sugar cookies. But this year I tried the Chocolate Peppermint Sandwich cookies from your new cookbook. And I also tried the Gingerbread Cheesecake Bites. Both are winners! I can’t wait to try this Italian Christmas Cookie! For the holidays, I love lacey tulles, dipped in dark CHOCOLATE! I love all cookies! Now that I’m following THM I love the chocolate moisties! I’m going to add mint extract next time. Fave holiday cookie – the humble Russian Teacake. I love cut-out cookies! Swerve is my new BFF!! I love Peanut Butter Blossoms and Russian Tea Cakes. Really most cookies 🙂 Looking forward to trying this low-carb version of Italian Christmas Cookies! I love Orange Icebox Cookies and Gingerbread cookies for the holidays but a really good chewy chocolate chip cookie can’t be beat! I love peanut butter cookies with a Hershey kiss ? I love Christmas cookies, sugar and praline. MY favorite are just good ole chocolate chip cookies ? Any sprinkles are fine. There are no sugar-free ones on the market but you only use a little so it adds virtually nothing to the carb count. Oh and you can use whey protein powder. My favorite cookie is thumbprint cookies. My favorite are Christmas cut out cookies. I just made them using almond flour and swerve, my family loved them! I’m a fan of pretty much any kind of cookie! But I did make some snickerdoodles with Swerve just this weekend and they were wonderful! My favorite is a classic chocolate chip cookie, all the way! I love classic chocolate chip, m&m, or oatmeal chocolate chip cookies! My family usually gets the variety cookies in the tin at the grocery store around the holidays I always loved those, especially the chocolate/vanilla swirl ones with the pink outside! My favorite is Rugelach – an apricot and walnut filled cream cheese dough crescent. I love gingersnap cookies especially if they are the soft and chewy kind! I love making (and giving away!) chocolate-peppermint cookies. I love frosted sugar cookies made with cookie cutters! Trader Jos peppermint oreos covered in chocolate! So I’d have to say my favorite cookies would be Shortbread or Ginger cookies. Brings back some wonderful memories. Thanks so much for the chance to win! My favorite holiday cookie are sugar cookies. Whoopi pies are my favorite cookies. I do also like Mexican wedding cookies. Whoopie pies with peppermint filling rolled in crushed candy canes!! Molasses cookies all the way!!!! It could only eat one cookie for the rest of my life that would be it! It’s my grandma’s recipe! my favorite holiday cookies are rum balls. I love Russian tea cakes that my Mother in law makes. Coconut macaroons topped with a little dark chocolate!! Yum. I absolutely LOVE anything Chocolate, but I think my favorite would be a simple sugar cookie with a chocolate drizzle! I love all cookies all of the time but iced sugar cookies are so special at Christmas. I love love love sugar cookies with frosting!!! My favorite cookie are cutouts or sesame cookies with orange flavoring or white chocolate with cranberries or a real good chocolate chip or….okay I love them all! My favorite has to be sugar cookies! My favorite is peanut butter blossom. My favorite is chocolate chip. Finally found Swerve in the grocery store so I’m excited to try new cookies recipes this year. These cookies look wonderful! Can’t wait to try them!!! Shortbread cookies have been a favorite of mine in the past. Now I’m open to any low carb treats! They look delicious. It would be hard to stop at two! Our favorite are sugar cookies, family fav. My fav is mincemeat. Would love to learn how to make these low carb. Where do you get sugar/gluten free sprinkles? I haven’t found any anywhere! Other than that, I can’t wait to make these! You don’t, sadly! But there are so few on each cookie that it doesn’t raise the carb count at all. Just makes it look pretty! Shortbread and gingerbread cookies are my favourite!! My favorite holiday cookie is any cookie that can stand up to being dunked in my coffee! There is something about dunking a cookie in coffee that feels like a treat. I like gingerbread and chocolate chip cookies. I love monster cookies with M&Ms! My favorite cookie is my husband’s great grandmothers sugar cookie. Perfect every time! I have a batch of these Classic Italian Christmas cookies in the oven right now and my home smells wonderful! Thanks for all the recipes, Carolyn! My favorite is thumbprint cookies. I’ve been soooo obsessed with your recipe for twix thumbprint cookies. They are AMAZING! I have recently gone sugar free and grain free but so far have not found a sweetener or flour replacement to bake anything yummy for Christmas. I have not seen Swerve in Fry’s or Walmart in Yuma so I haven’t tried it yet. I also don’t know what non grain flours replace all purpose flour the best. I only gave a little hand mixer so the mixmaster and packages of Swerve would be an amazing gifts, wish me luck! Russian Tea Cakes always make me happy and can only be eaten during Christmas time. Frosted sugar cookies like my grandmother made! Snowball cookies and Christmas cutouts like my mom used to make. Never ever have I found a recipe that was even close and I fondly remember the turkey roaster full of cookie dough chilling in the fridge overnight and mom’s reaction to all the “dimples” of dough missing when she went to roll them out ? My favourite cookies are my nanas chocolate chip cookies with extra cocoa and chocolate chips to make them extra chocolatey! My favorite cookies are my mom’s lemon bars. She could make them ‘just right’ whereas when we made them, they would never set! Our newest favorite holiday cookie is Carolyn’s “No Bake Mint Cookie Cup” EGG FREE! Mexican wedding cookies and cut outs were always my favorite. Just made gingerbread cookies for the first time. I need to fund a low carb gingerbread recipe. These look dekishious! Ginger macadamia cookies are an absolute favourite. Short bread is my favorite Christmas cookie! I love the sugar cookie cut outs made with sour cream. I frost them with the kids. Soft Sugar Cookies with thick frosting. Yum. I LOVE gingersnaps! It’s just not Christmas without them! Trying this recipe with what Swerve I have left. Thanks! My favorite cookie at Christmas is Snowballs/Swedish Wedding Cakes. I actually love these anise cookies that my mother in law makes; it’s a german recipe that’s been handed down for three generations – or so she says! I could only eat them for two holidays before I had to quit so I’m excited to try these! Sugar cookies are my favorite! Can’t wait to make these! How long will these keep? I would like to make them ahead! Thanks for all your lovely recipes! I’ve got a batch in my freezer. That’s always the best way to make things last. Well, for years I have always loved Italian wedding cakes or pecan snowballs, However, this year I have made so many of them (and ate waaay too much of them! and I have decided to never eat/make another batch again, that is until I found your version of them! I was so very excited to see I can make them healthier! I will however wait till after Christmas to make them! he he Merry Christmas everyone! I love Christmas cookies. They are my favorite! My family favorite actually are anisette Italian cookies that look like this! Excited to try these! We love to make sugar cookie cutouts…. I think my children like the decorating part better than the eating part! So excited to try baking these today! QUICK QUESTION: Do you know whether you can tint granulated Swerve with a drop or two of food coloring like you can regular sugar? I just received my first shipment of Swerve the other day and am so excited to be able to do some Christmas baking – a treat I thought I would miss out on since we have been low carb since July (40 lbs down – many more to go, but feeling like it’s finally going to happen!!!). My favorite Christmas cookie is a toss up between my Grandmother’s Scotch Shortbread Cookies and Pecan Florentines (dipped in chocolate on one side and sandwiched, of course!). Can’t wait to make these, Carolyn. I have enjoyed every recipe of yours that I have tried! I love cookies! My all time favorite would be traditional, frosted, rolled out Christmas cookies so I am looking forward to trying out your recipe for Holiday Cut-Out Sugar Cookies. I need a lot of Swerve because I am making several recipes from your book, “The Best Low-Carb Holiday Cookies and Bars. I love just a good old fashioned chocolate chip cookie! I love a snicker doodle. Our family favorite is sugar cookies. I haven’t had a Italian Christmas cookie since my mother passed away in my late 20’s! I can’t wait to try these and share them with my friends and family ! Merry Christmas ! My favorite Christmas cookie would either be a Melting Moment (melt in your mouth shortbread with orange juice/icing sugar glaze) or mint Nanaimo bars. These look delicious! Love Swerve. Any kind of shortbread cookie. Your cardamom orange shortbread is to die for. Yes, I love rich, buttery cookies. My favorite is iced sugar cookie. These look delicious. I’ve always been a fan of frosted cookies, but only at Christmas! My favorite Christmas cookie is my grandma’s waffle cookies. I haven’t had them in years! I’m planning on making some to take to my sister this year. I do look forward to trying this new recipe. They look delicious! Mmmmmm……..love me some sugar cookies! I like kolackys the best. Thank you for helping to make this giveaway possible! Merry Christmas, Carolyn . Thank you for these lovely recipes you gift us with all year, but especially now. You make it so easy to “keep the faith”. Love me some shortbread at Christmastime. I’m not sure I’ve met a cookie I didn’t love 😉 I take that back – I think adding raisins to a cookie is an act punishable by law. Or at least, my disdain. But right now I’m craving a soft gingerbread cookie. Time to bake! By far, sugar cookies are my absolute favorite! My favorites are my mother’s sandtarts. I think they are like Russian tea cakes, except formed into crescents. I have made them with almond four and powdered Swerve for a healthier version. Yum! My favorite are thumbprints with icing in them!